In which Mike rambles on about comic sales, and also simultaneously laments and looks forward to new Superman comics. So I noticed that All Star Western received a slight bump in sales over the last couple of issues, thanks to Booster Gold’s guest-appearances. 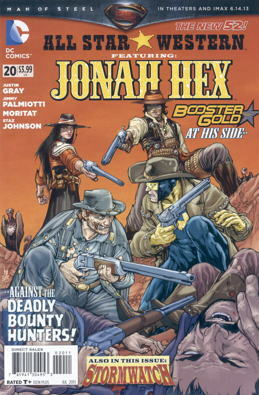 I suppose this currently storyline may put out a Jonah Hex purist or two, but let’s face it, Jonah Hex is part of the DC Universe, and if the occasional crossover from that universe helps to keep a DC title on the stands that isn’t yet another variation of a Batman, Superman or Green Lantern title, then crossover-away, sez I. Plus, if you’re a fan of a certain age, the certainly deliberate evocation of the mid-1980s Hex series may inspire a nostalgic twinge or two…assuming you were a fan of that Hex series in the first place, but of course, why wouldn’t you be? An interesting note about my old post that I linked there…I make a brief aside that we never learn how Jonah Hex returned to his own time from that future, that maybe it’ll be a plot point in some future Booster Gold story or something. Well, given that Gold is in the current Jonah Hex comics now, and that we know that Hex ends up in the present day DC Universe at least briefly…so maybe I kinda sorta foretold the future there. Well, not that it’s the same continuity or anything, but that’s close enough for me to toot my own horn for a few dozen words in a blog post. Speaking of Green Lantern, in that I wrote the words “Green Lantern” in the first paragraph, I’ve noted that the special extra-sized “so long to Geoff Johns”/”so long to Geoff Johns’ storylines” Green Lantern #20 is being taken as a good jumping-off point for a few of our customers, which has me wondering about future sales on the franchise. DC did it to itself, really…it was able to grow its Green Lantern line into four heavily-linked core titles so long as interest in the ongoing storyline in those titles was strong. It was a rare case of reader reluctance to pick up yet another related series being overwhelmed by desire to keep up with the franchise. Not that there was a one-to-one correlation in sales…the main GL book usually outsold the others by about 2 to 1, but there were still some customers buying all the titles. However, now that the story, or at least Geoff Johns’ iteration of the story, is “done,” as much as an ongoing superhero comic can be done, the impetus to follow all the GL franchise books is diminished, particularly with the turnover of creative teams on all the books occurring simultaneously. Okay, it’s not like Green Lantern sales are going to dry up overnight, but I am expecting some dropoff as folks reconsider whether they need to follow four ongoing GL titles a month. On the topic of franchise books, there’s that Superman Unchained comic that’s headed our way soon…a comic being ordered in such hideously large numbers I actually had one of our distributor reps ask me “why are people getting so many of these?” The answer is…well, a bazillion variants based on sales plateaus (a Jose Luis Garcia-Lopez one for me, thank you! ), plus the fact it’s written by Scott Snyder, who’s had some success with that Batman series, and illustrated by Jim Lee, which is kind of a big deal, but yeah, there’s going to be a lot of copies out there in the marketplace, making this the 1991 X-Men #1 of the 21st century (or the Shazam! #1 of the 21st century, for those of you old enough to get that implication). I am looking forward to the book, and I do suspect it will sell well, though probably not at the numbers everyone is ordering. I have enough interest locally in the variant covers to help subsidize the order I placed, but still…sheesh. DC cast out the line, they successfully reeled me in. But Scott Snyder and Jim Lee on a Superman book…I think this will be the series that gives us a New 52 Superman that actually feels like a big ol’ Superman comic, unlike most of the attempts at trying (with varying success) to reestablish Superman since the whole New 52 relaunch was dropped on us. And that Greg Pak/Jae Lee Batman/Superman series feels promising, too. We’ll see soon enough. Anyway, what your pal Mike is saying is that he wants to enjoy good, new Superman comics. Like that Adventures of Superman …it’s not New 52 Superman, which I imagine is a selling point for a lot of you, but it’s swell to boot, so thankfully the hoohar around that title all worked out for the best. As much as I want a BOOSTER GOLD ongoing back (and I’m sure you’ve all heard the Internet rumor that I promise I didn’t start that there is one in the pipeline), I’d be quite happy if Booster bounced around the DCnU, each month appearing in a new book to make the regular star’s life a little bit more difficult. Certainly, it can’t hurt to increase Booster’s exposure a little before relaunching him as the time cop for whatever passes as history in the New 52 Universe. And if Booster’s guest-starring presence can provide a little sales boost to flagging titles, all the better. I just have to tell you Mike… that I always find your writing to be so friendly, freewheeling and FUN (and not to mention… WELL WRITTEN) that I always enjoy your posts – even if they’re about stuff that I care about not a whit (ie: Superman, Booster Gold, Green Lantern). And that Jose Luis Garcia-Lopez art is gorgeous! Interesting commentary, as always. The Booster Gold/All-Star Western sales bump is good news since I read the trade collections and have enjoyed the series so far. You also nailed the Green Lantern prediction (and the thinking behind it) with respect to my own purchasing habits. I came on board during the Sinestro War way back when and just jumped off with issue 20. It was certainly a phenomenal, character-defining run. I went the other way regarding Superman Unchained sales in my New Year’s predictions. Based on your comments and my LCS order numbers, it looks like I was way off base. Considering how much I loved Snyder’s “The Wake”, it seems the man is destined for an Eisner or two. Finally, I just read the Adventures of Superman this morning and agree – it was good fun. STORMWATCH appearing in Jonah Hex? If I hadn’t dropped the title already, I would NOW. Booster Gold, though, that’s NEAT. (Jonah appeared in Boosters’ solo title, BTW). I’ll definitely be dropping Red Lanterns. Aside from the fact that I found the first year of the book unbelievably boring, I just never got into their involvement in the Third Army / First Lantern nonsense. The big takeaway from the first twenty issues is that a Bleez that can talk is just as annoying as a Bleez that can’t and humans always ruin everything. That said, I’m also far more likely to drop Green Lantern than either of the other two books. I just like Guy Gardner, Isamot Kol, Jon Stewart, Fatality, Kiliwog, Arkillo and the rest of that wacky gang of idiots more than Hal Jordan himself. Regarding the Superman titles, it’s interesting to see how close to 50/50 the variant covers for Superman Unchained #1 are when it comes to ‘red trunks over blue tights’ vs ‘no trunks over blue tights’. It looks like that Superman/Batman cover goes with no trunks. I am always conflicted about Jonah in th DCU but I’m happy the crew that does his regular book is handling the time travel this time.